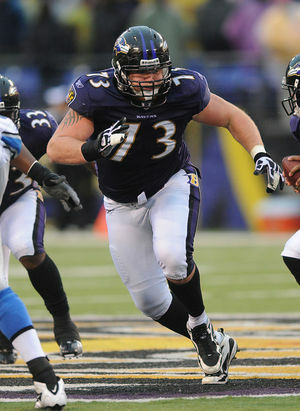 Ravens right guard Marshal Yanda didn't enter the NFL with the same buzz as left tackle Jonathan Ogden. Ogden, the first draft pick in Ravens history, was selected to 11 Pro Bowls, won a Super Bowl ring and is considered one of the greatest linemen in NFL history en route to being enshrined in the Pro Football Hall of Fame in 2013. Yanda, a third round pick (86th overall) in the 2007 NFL Draft, may not have a bust in Canton, Ohio yet, but many believe he will be there one day. Others are taking notice of Yanda's impact on the Ravens, too. The nine-year veteran was dubbed the best lineman in the NFL by the sports website Grantland.com and Pro Football Focus named Yanda the fifth-best player in the NFL. Even video game fans are starting to understand how good Yanda is today. Yanda received a rating of 98 by EA Sports' Madden video game, which is one point shy of a perfect score. Despite the added attention, the low-key Yanda, a four-time Pro Bowl selection, remains focused on helping set the tone on the Ravens offense and getting the team back into the postseason for the seventh time in eight seasons. "Obviously, I take pride in working hard and being the best player I can be," the 30-year-old Yanda said. "But I’m more worried about the football team and us as an offensive line and us as an offense more than that. Quarterback Joe Flacco said he is definitely glad he has had Yanda to help protect him for his entire career. He called Yanda the best lineman he has seen. The road to greatness did not come as easy for Yanda as it did for Ogden. The former University of Iowa standout. Yanda was limited to just five games after suffering a season-ending knee injury in 2008. But since 2010, Yanda has missed just two games and has started every game he has appeared in during that span. During this run, Yanda's blocking has helped many players establish career marks, including running back Justin Forsett, who rushed for a career-best 1,266 yards in 2014. In 2011, running back Ray Rice scored a franchise-record 15 touchdowns (12 rushing, 3 receiving) and rushed for a career-high 1,364 yards and led the NFL with 2,068 yards from scrimmage. In 2011, Yanda signed a five-year, $32 million contact. A year later, he helped the Ravens win the franchise's second Super Bowl title. As he enters the final year of that contract, there is hope Yanda re-signs with the Ravens and ends his career in Baltimore much like Ogden and future Hall of Fame linebacker Ray Lewis were able to do. Right now, Yanda said his focus in just on this season and trying to continue to improve.